Mannerheim was invited to be the first honorary scout of the Finnish Scout Association on 16 August, 1919. He had great regard for the scouts ideals of chivalry and self-sacrifice, and was of the opinion that these ideals would help them "to win over their more underprivileged brothers into the service of the good and the noble." On 15 February, 1920, he donated the scouts the so-called Mannerheim badge to be awarded for merits in scout activities. The badge was designed by Akseli Gallen-Kallela. 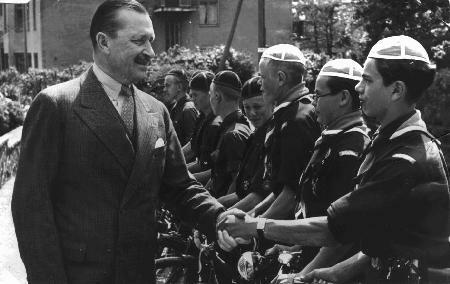 Mannerheim remained a supporter of the scout movement, and in 1936 he was chosen honorary chairman of the Finnish Boy Scouts. Reciprocally, the scouts participated in the parade of the Flag Day in 1919 and were prominently represented  altogether 11,000 young scouts  at Mannerheims funeral.